Apparently, Sony Pictures films have been pulled from Netflix. Netflix claims that it's a temporary issue due to a contract dispute between Sony and Starz (a Netflix partner from which it gets many of its streaming movies). Other reports, however, say that there's no contract dispute, but that Starz just pulled the plug on those films. Either way, this kind of thing is never a good idea, because it's treating consumers as pawns. One of the reasons why Netflix has been so damn successful all these years is its focus on making the customer experience top notch. Removing content like this is never a good idea. These companies have to realize that they're still fighting to convince people that these services are worth paying for and that jerking them around by removing content isn't going to convince the people who were on the fence. The latest in a long line of ridiculous lawsuits from an entertainment industry that refuses to adapt and loves to put up artificial barriers, is the case of Disney suing Dish Network. Dish's infraction? Apparently a promotional decision to offer the Starz movie network for "free" to its subscribers (of course, it's not really free, since you have to pay to subscribe...). Disney claims that it has specific licensing deals with premium channels like Starz, which say that the films it licenses can only be shown on "premium" pay-TV tiers rather than basic tiers. The idea (of course) is that Disney wants to extend the ridiculous and outdated "windowing" efforts of Hollywood. But, here's the thing: Dish Network is not a party to that contract. Dish should be free to offer whatever channels it wants in whatever tiers it wants, so long as it has the appropriate agreement with those channels. I can't see how Disney has a claim on Dish here, since it's a third party, which is simply making a reasonable business decision that it wanted to offer Starz as a part of a lower tier. Disney is claiming in the lawsuit that this "devalues" its movies. No, it does not. What "devalues" the movies is the silly windowing plans of the studios that make those movies less valuable to consumers. Of course, Disney is claiming that this isn't a contractual issue, but a copyright one, but even that makes no sense. Dish's license with Starz clearly includes a license to display the content. And Dish is clearly paying to carry Starz, so everyone's getting paid. The only issue is that Dish decided, for promotional reasons, to include Starz in lower tiers for no additional cost for a year (Disney, falsely, repeatedly claims this is "free.") It seems that Dish should be free to offer whatever promotion it wants to its consumers, seeing as all the other terms of the license are the same and everyone's getting paid. 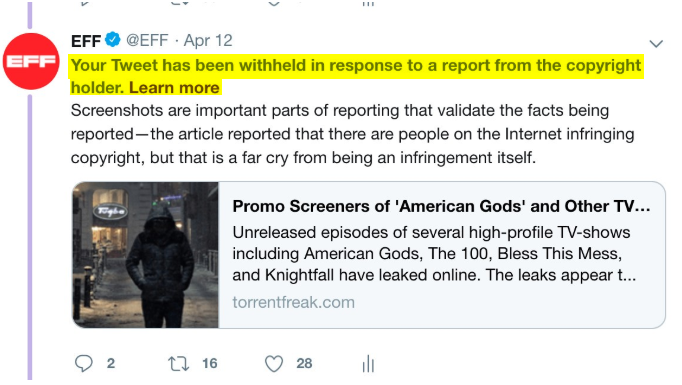 I could see how Disney might have a complaint against Starz for the way it licensed content to Dish, in which Dish was allowed to offer this kind of promotion to consumers, but going after Dish for copyright infringement, just seems silly. If anything, saying that downstream providers can't set their own pricing seems like Disney is opening itself up to a price fixing claim. It made its deal with Starz. Dish then did its deal with Starz. Dish should then be free to determine how much it charges consumers.